What a nice close to the year for young sire Harbinger. Tokyo, Japan: Two-time Olympian Boyd Martin is to host ‘retraining the racehorse’ clinics in Japan this December, in partnership with the National Riding Club Association of Japan (NRCAJ), the Japan Racing Association (JRA) and Godolphin, the global thoroughbred breeding and horseracing team founded by His Highness Sheikh Mohammed bin Rashid Al Maktoum, Vice President and Prime Minister of the United Arab Emirates and Ruler of Dubai. The partnership, which is the first if its kind in the region, will promote the versatility of racehorses and their ability to adapt to alternative careers after racing. It represents a significant move by those invested in the thoroughbred industry in Japan to promote the retraining of racehorses and ‘second careers’ for thoroughbreds. ^^very cool. It would be nice if the example set by Northern Farm could be more widespread, kudos to Japan for investigating second career training for OTTBs. 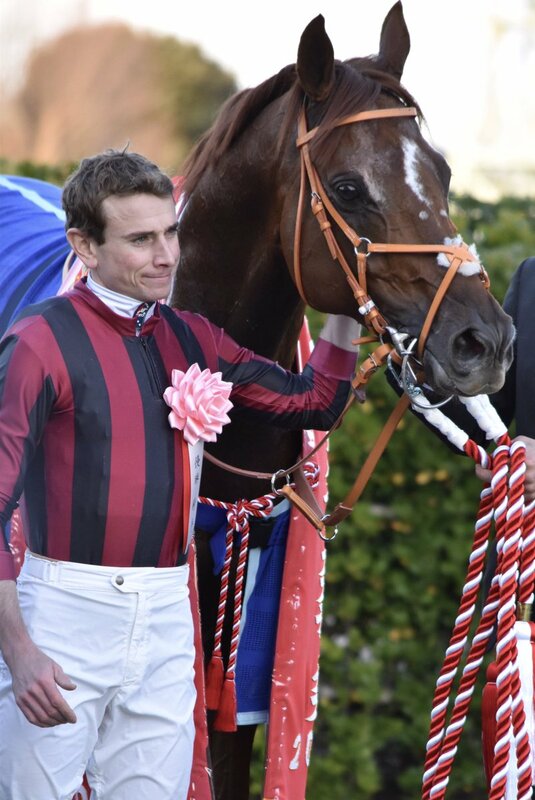 Japan Cup hero Cheval Grand is under consideration for the Dubai Sheema Classic on March's Dubai World Cup card. His half-sister Vivlos won the Dubai Turf this year. Some of Japan's best have arrived safely in Hong Kong for the Longines Hong Kong International Races next weekend (Dec 10) at Sha Tin: Neorealism (HK Cup), Staphanos (HK Cup), Kiseki (HK Vase), Lets Go Donki (HK Sprint), and Satono Aladdin (HK Mile). The Vase will have Highland Reel (GB/IRE) & Talismanic (GB/FR) in the field; the Sprint will include Stormy Liberal from the US and the Mile will have Roly Poly (USA/IRE). Smart Layer (HK Cup), Once in a Moon (HK Sprint) & Tosen Basil (HK Vase) made the trip as well. Brilliantly ridden by Ryan Moore for the 3rd time! Albert is a handsome guy, cool face markings. Albert(JPN) became the first horse to win the Stayers Stakes three years in a row. And we can find many sources of stamina in his pedigree. Nice to see Admire Don (by Timber Country), best known for his exploits on the dirt track, leave behind a good son after being exported to Korea. And you're right; he certainly has a pedigree loaded with stamina. And like many others I too am a fan of his unusual facial markings. Ryan Moore did it again! 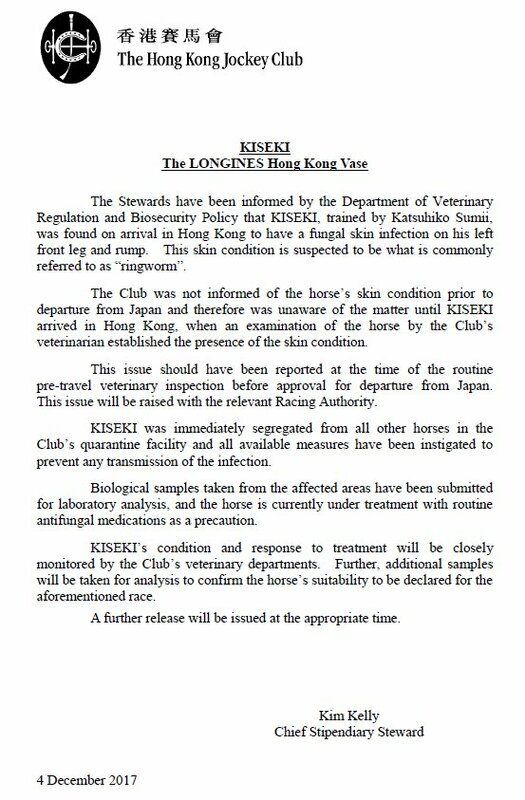 Group One-winning Japanese three-year-old Kiseki is under a cloud for Sunday’s HK$18 million Longines Hong Kong Vase, and causing a behind-the-scenes rift between the Jockey Club and the Japan Racing Association after arriving with symptoms of ringworm, a highly contagious fungal infection. It's ironic that Hong Kong, which drew the disapproval of Australian health officials by creating that mainland China training center, has had an infected horse come in from Japan. IMHO, this incident provides proof that stringent health protocols and quarantines are important for every country. Thanks Kate Hunter for the wonderful report! 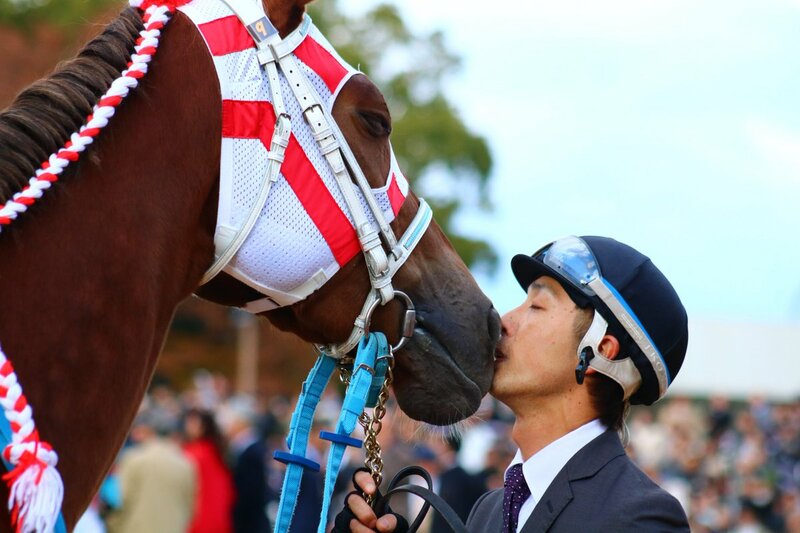 First G1 winner for ORFEVRE ! The Zen Nippon Nisai Yushun will be run tomorrow. Le Vent Se Leve(JPN), 2015C. Symboli Kris S(USA) x Maestrale(JPN) by Neo Universe(JPN), wins the Zen Nippon Nisai Yushun 1600m dirt at Kawasaki on Dec 13th 2017. 3-3-0-0. He looks like a promising colt!! Go, Le Vent Se Leve! Exciting prospect Le Vent Se Leve kept the buzz going in Wednesday’s Zen-Nippon Nisai Yushun at Kawasaki, readily justifying favoritism to stay perfect in three starts. The Kiyoshi Hagiwara trainee banked 10 points on the Japan Road to the Kentucky Derby, and garnered plaudits for the decisiveness of his victory in his nation’s top race for dirt juveniles. After breaking a beat slow from post 9, the G1 Racing Co. colorbearer found himself racing further back in the pack than in his first two wins at Niigata and Tokyo. But regular rider Mirco Demuro patiently gave Le Vent Se Leve time to regroup, and the favorite was ready to uncork a power-packed rally on the far turn. Le Vent Se Leve circled the field, generating so much momentum entering the stretch that he needed a couple of strides to organize himself. He soon switched to his correct lead – meaning that he began to drive forward with his right leg ahead of his left – and blew by the pacesetter Southern Vigorous. Second choice Hayabusa Maca O, who had been chasing the early leader, was already fading from contention. Although Don Fortis, the third pick, closed boldly in deep stretch, Le Vent Se Leve was in total command. 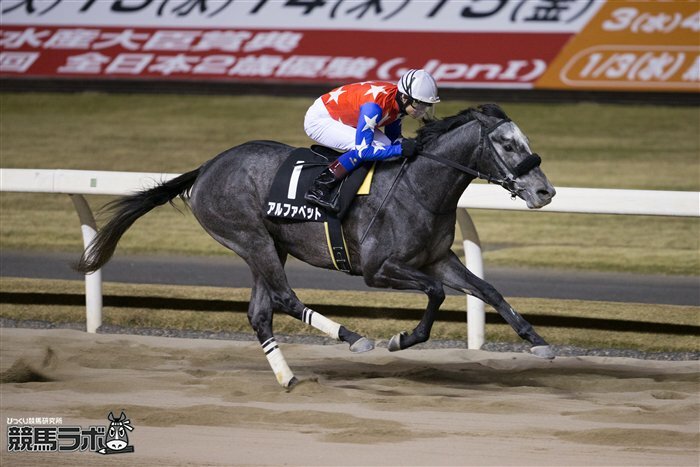 Demuro had him under wraps that last furlong, and the winner still clocked the fastest final 600 meters (about three furlongs) in :38.20 to win in a gallop. The one-length margin, and his time of 1:41.60 for the metric mile, don’t reflect the degree of his superiority. Don Fortis earned 4 points for his fine runner-up effort, three lengths clear of Haseno Pyro (2 points for third) and Dark Repulser (1 point for fourth). Southern Vigorous wound up eighth, and Hayabusa Maca O 10th. The Zen-Nippon Nisai Yushun offered the same number of points (10-4-2-1) as the first scoring race on the Japan Road, the Cattleya Sho. While Le Vent Se Leve is tied on the Japan leaderboard with Cattleya Sho winner Ruggero, his formline appears stronger. That’s partly because a colt whom Ruggero narrowly beat in the Cattleya Sho, third-placer Meiner Yukitsubaki, had been beaten by a much bigger margin when fourth to Le Vent Se Leve in their prior start. The third and final points race in Japan, the February 18 Hyacinth over a metric mile at Tokyo, is the logical spot for a head-to-head match-up between Le Vent Se Leve and Ruggero. The Hyacinth will be the tiebreaker with its 30 points to the winner. Le Vent Se Leve is now on a path to emulate – and arguably outstrip – stablemate Epicharis. The 2017 Hyacinth winner who thereby topped the inaugural Japan Road to the Kentucky Derby, Epicharis just missed to Thunder Snow in the UAE Derby (G2) and skipped Churchill Downs. He shipped to New York for a tilt at the Belmont S. (G1), only to withdraw with an injury. 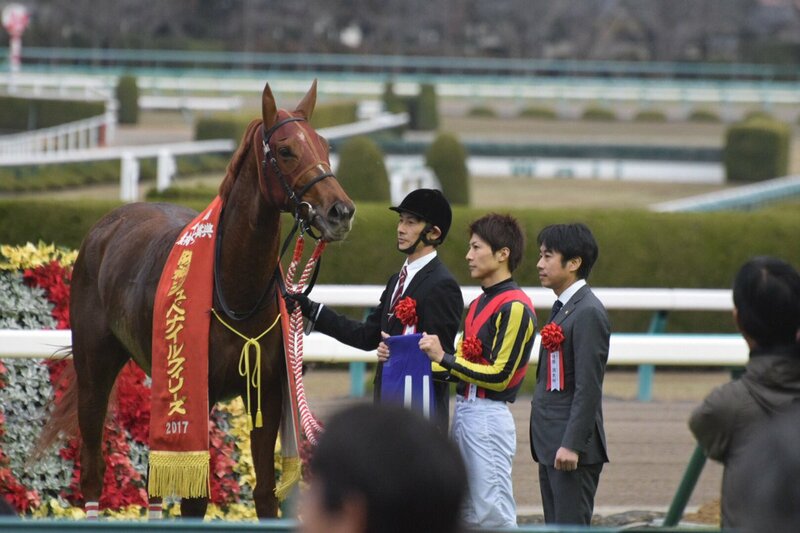 By two-time Japanese Horse of the Year Symboli Kris S, Le Vent Se Leve is out of the winning Maestrale. She is a daughter of Japanese champion Neo Universe, himself by the legendary 1989 Kentucky Derby (G1) and Preakness (G1) star Sunday Silence. Le Vent Se Leve’s second dam (maternal granddam), Autumn Breeze, is by U.S. champion Timber Country, hero of the 1994 Breeders’ Cup Juvenile (G1). Third in the 1995 Kentucky Derby, Timber Country rebounded by taking the Preakness. The White Christmas Stakes for gray and white horses was run at Kawasaki last night.